New realizations ~ New methods! Fresh ideas to choose from~ lots more to paint. I can’t believe it has only been two weeks since my recent painting retreat. It was a much-needed break just for painting! I found my self so excited to paint. Yet, the analytical part of my artist was overwhelmed with cataloging the variety of compositions and palette possibilities. Everything was already painted in raw pigments and it changed every few minutes. No kidding, the morning light changed so quickly we could barely contain our excitement let alone finish drink our coffee. The afternoon and evening sun was just as dramatic. I could barely record it all on my camera. So I painted what I could, and came back home to paint more in my studio. I came home ready to paint. Over the next few days I walked into my studio and promptly froze at the easel trying to pick a painting to start next. It should not be this difficult. It’s not, I was just over complicating it ~ trying to guess what the next sale could be. And yet, there I stood. I turned around and walked out of my studio more frustrated than I realized. A few hours later I had regrouped, cropped and printed most of 20 plus thumbnail images from my recent adventures as well as other local plein-air treks. These were all in my “to paint” files. I took them upstairs and sat on my studio floor. Meanwhile I lined up all of my fresh RETREAT paintings to remind me of what I wanted to paint. I made a fresh cup of tea and just looked at the images. I spent a few more hours just evaluating the unique interest I had with each printed reference. Eventually, the exciting ones made it into a smaller pile, which I then taped to my easel wall. 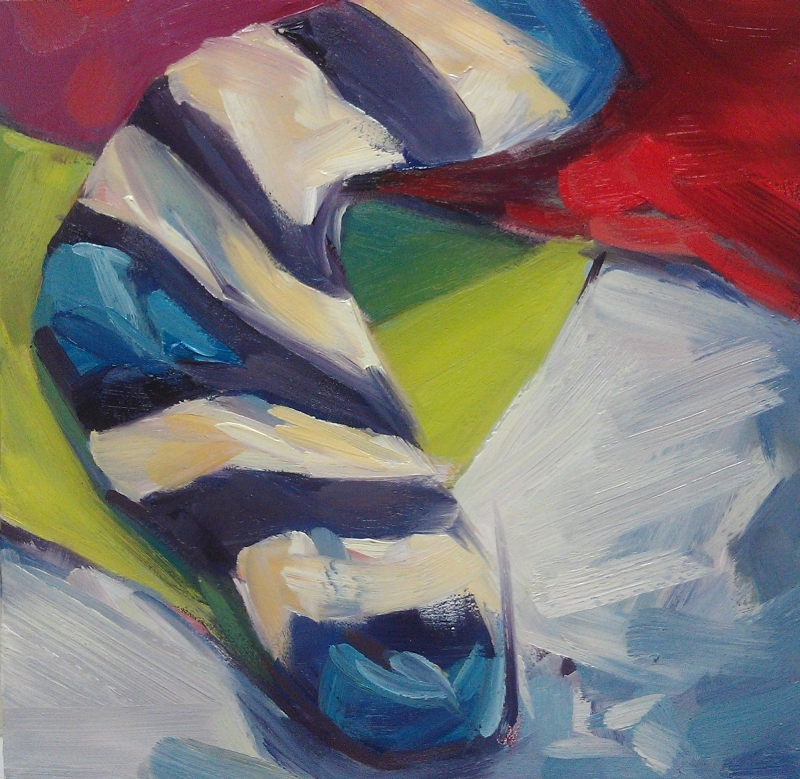 I discovered I was looking for a certain tangible energy in my subjects and paints. 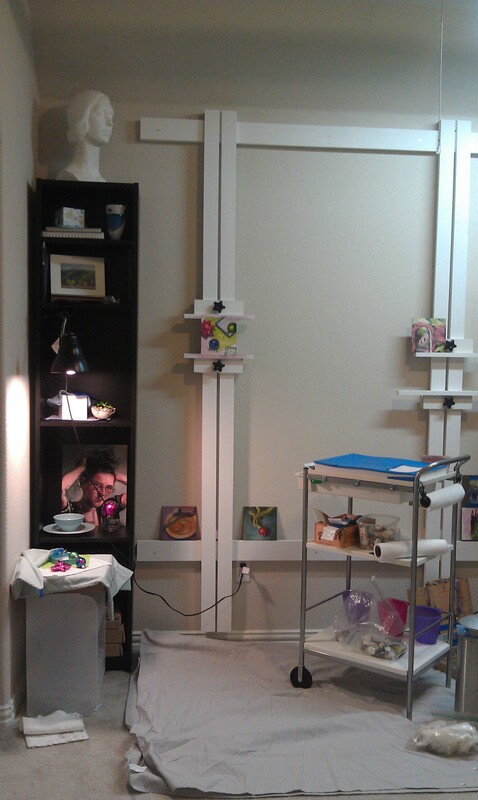 I realized I was finally gaining a bit more clarity in my studio again for a little while before family life returned. 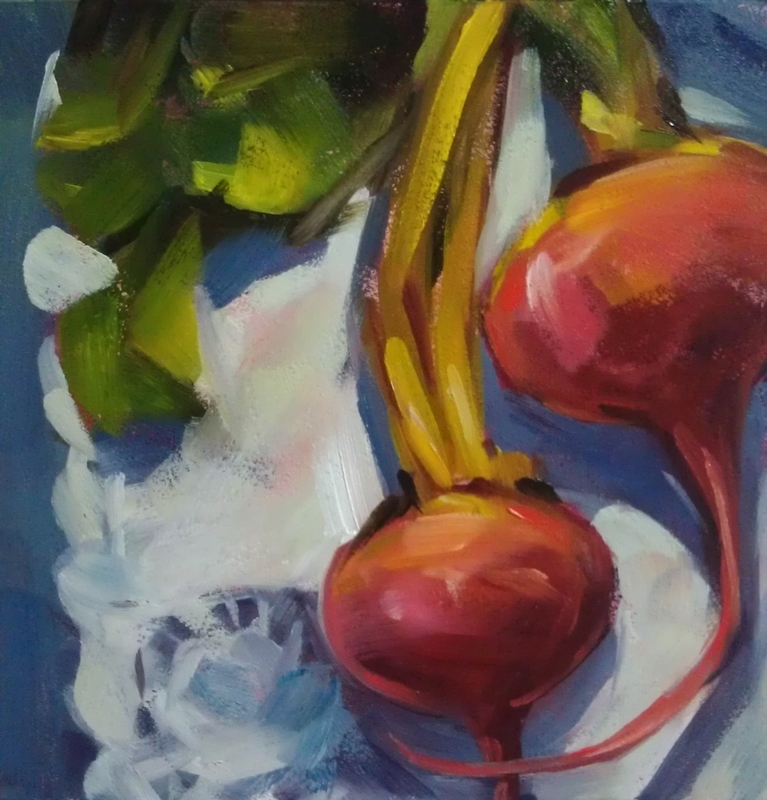 I came back with some great paintings but I also came back with a few new realizations for determining what is driving me to paint these days. Don’t wreck it trying to “fix it“. In the past week I have painted a least 7 paintings. I have wiped away several of these after realizing they were “fix its”. I realized I could revisit the composition in a new way any time I wanted. Or I could simply paint something else EXCITING at the moment and see where it might lead. I have definitely scored a few surprises as well! Best way to get your daily vegetables – paint them! Today, I focused on simplifying my brush strokes to get more expressive paint movements. I set up a cool shadow warm light sequence. I pushed in loose lights with pure yellows to establish the brightness. Then loosely worked in my shape zones. No I did not count every brush stroke. 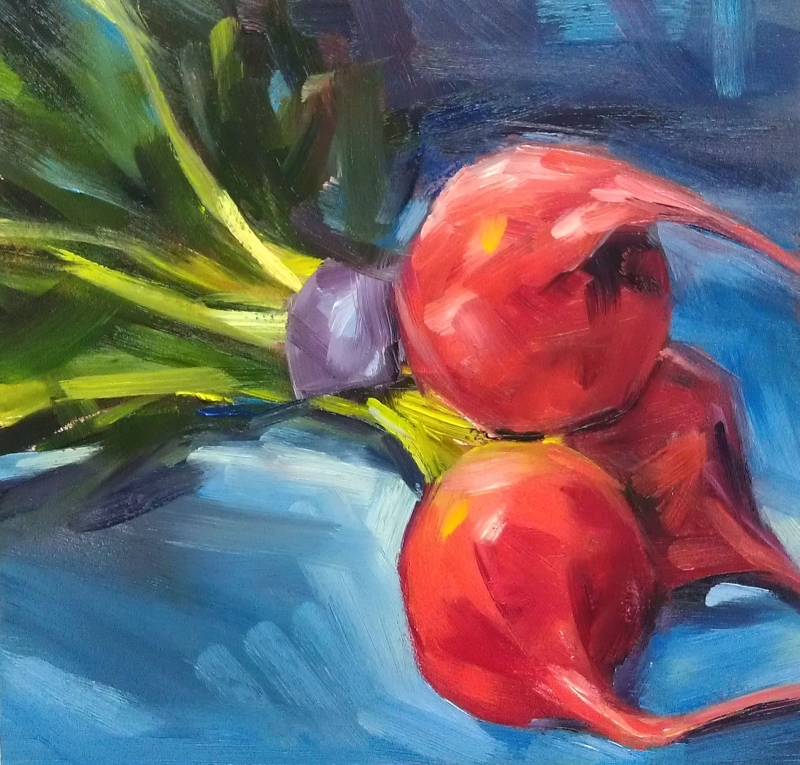 I did focus on effective color harmonies and working with my larger 1/2 filbert brush. I absolutely love this painting! It feels so fresh and lush. It has been most of six months and quite the progression for my fitting my old larger studio into my smaller home studio (10’x12′ room). 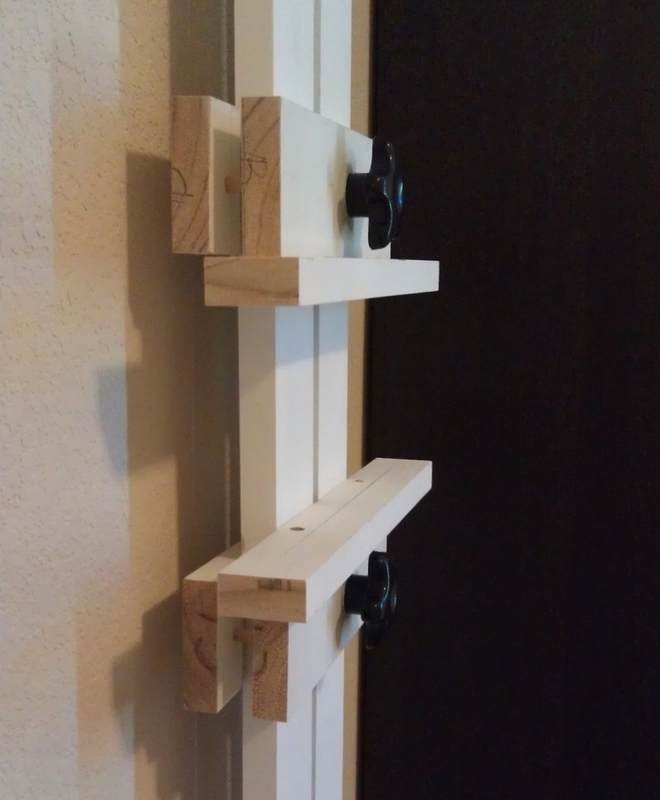 I recently completed a moderate “weekend” build project constructing my new wall easel. It has been a few weeks since finishing it out. I have had the chance to paint on it a few times (mostly smaller projects). It accommodate new ideas quite nicely and quickly, too. Thus far, I have just 3 vertical masts for the wall. 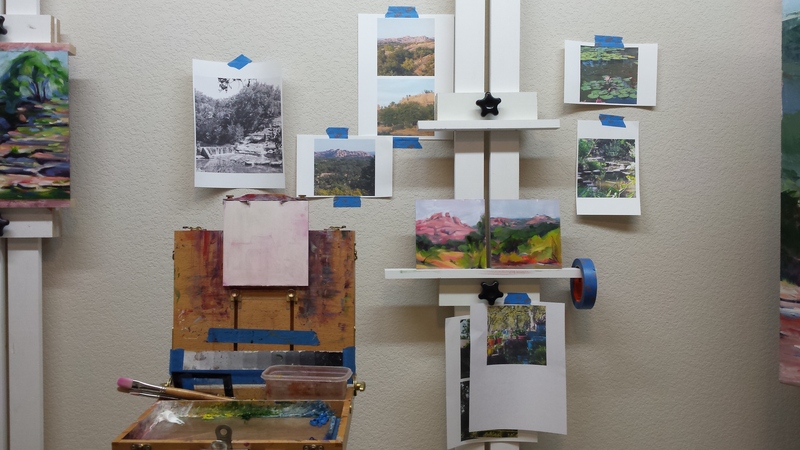 The shallow profile allows me to easily move my larger easel to ether side of my studio without hindering desired painting space. I am rather pleased indeed with the brain child of artist Jason Tueller’s easel design. Studio – still life setup. After stumbling into my larger space rover (43″ long x 18 1/4″ deep x 72″ high) far to many times, I decided to down size that too. I settled for a more mobile cart from the IKEA kitchen department. It’s all metal components offer forgiving clean up and flexible palette space. It is perfectly sized for hosting my masterson palette, paint tubes and other materials as needed. It even has a roomy drawer for my brushes and palette knives. Even better that it did not break my budget. I also added a few floater shelves for displaying smaller panels and a second narrow book case to host my additional art books and collections. The additional book case offers a nice spot to set up still life objects for painting. I plan to add a smaller shallow writing desk for my laptop and eventually a drop leaf drafting table to accommodate watercolors. Figuring out what I needed in my studio has been a longer process than I anticipated. I have had to cull more than I believed, and build more of what I needed to fit the purpose. But I am pleased so far, small and functional is the key to getting my studio back to work here. It has been a few weeks (I think ) since I have had something new to post here. I have been in a bit of pit. Most everything I have started, I have ended up scraping off and washing off. A few days ago I snagged a few more baubles and bits from the tree and bin of boxes & bows. I have been rearranging these things for a few days trying to settle on an exciting composition. Seriously, I have stated and scraped at least 4 studio paintings in the last week. Finally, something clicks! 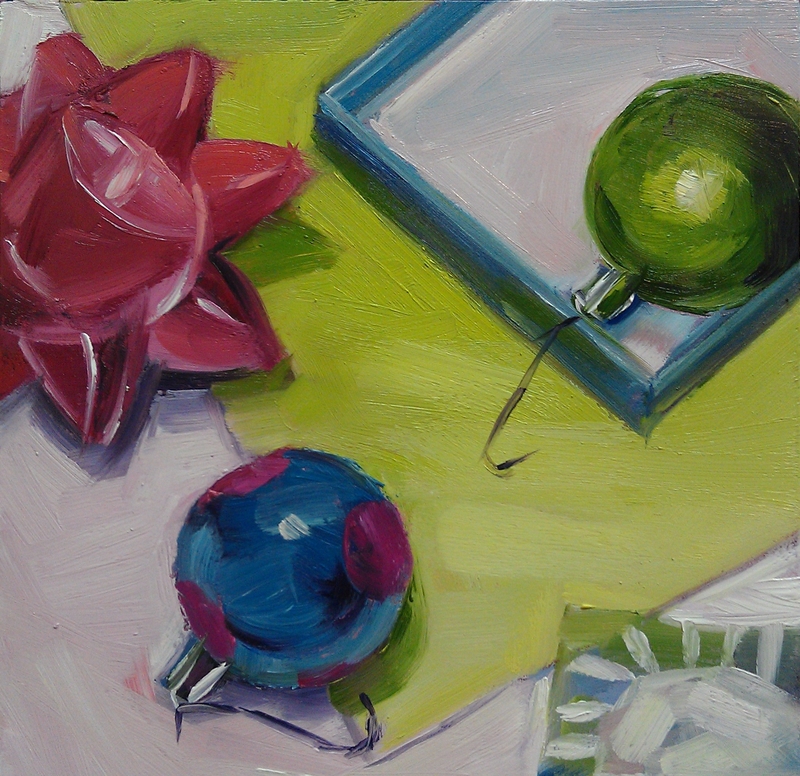 Try something new with the studio still life. Then I came back to re-established a few color spots to work more consistently. I focused on the high key color scheme and played with the visual diagonals. This one was definitely a challenge for jumping back into the studio again. I am quite pleased with the results. 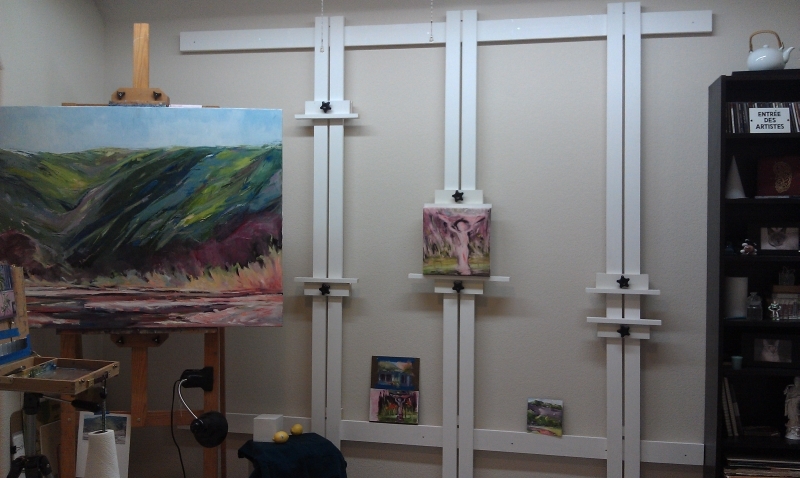 My wall easel is done and all ready to accommodate larger paintings awaiting my attention. The wall easel has a minimal depth requirement but can accommodate a 7’x8′ painting easily enough or multiples pieces at the same time. Wall easel & Clamps complete! Two weeks ago, I started building the wall easel for my studio inspired by artist Jason Tueller’s design and handy work. The first weekend, I knocked out most of the build project, installing wall braces and vertical rails in an earlier blog Oct 14 (Studio set up). However, I still needed to make the clamping bars to hold my paintings on the easel. It has been slower process to fabricate those parts. I had to trouble shoot how to notch out the back part of the clamp to fit around the vertical rails. I definitely wanted to have them adjustable in height to accommodate small and large pieces. So I had to plan my process to keep the wood blocks true during and after the build to provide a better fit on the vertical rails. I have limited tools. I have a circular saw, a drill and other basic carpentry tools. 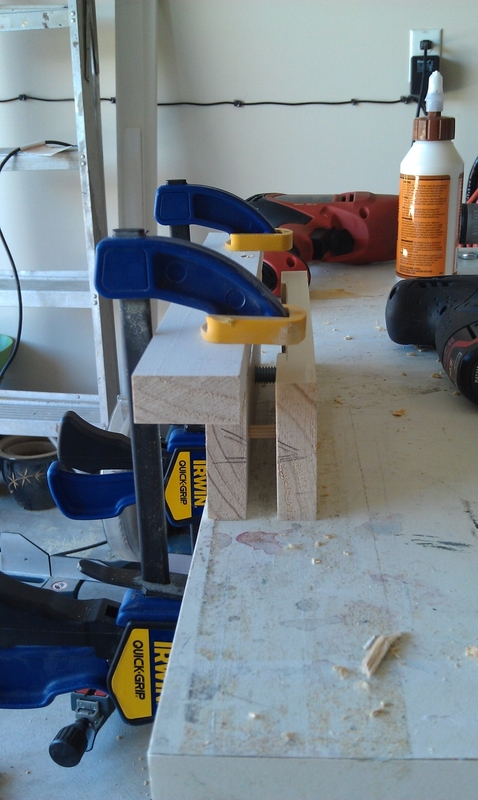 I did not have access to a table saw or sanding table that might have made quicker work of the pieces I needed. 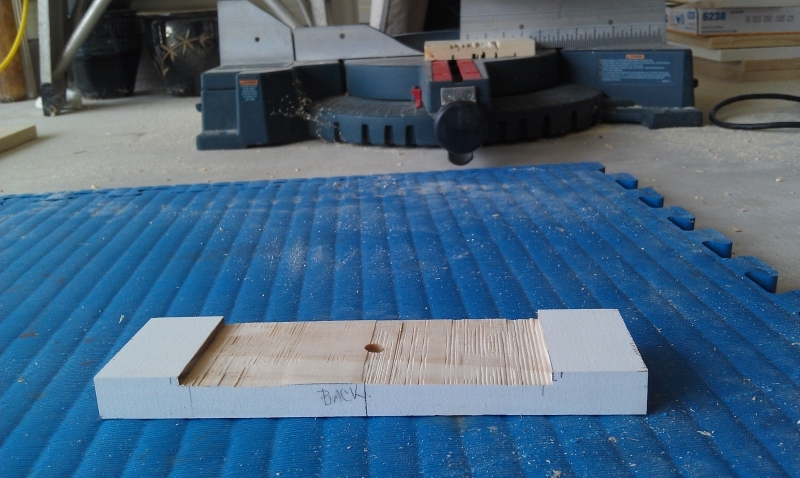 I am a smart girl, so I used set the depth on my circular saws to score out a 1/4″ deep notch. Then set to removing a six-inch section were needed. Sanded it a bit to remove any splinters. Then clamped the matching pieces, drilled peg holes and securing threaded flanges. I will admit they many not be flawless, but they definitely work! Now I am all set for starting and finishing my next big project!